? vs. ! | Johnson City, TN | Peeks Chiropractic, P.C. The question mark. Pause. Take a step back and look at it. It’s bent over. It looks tired. It has the posture of an old, crippled man. It appears that it cannot go far. It has lost its will to live. It can’t look up; it can only look down and see where it is standing, not where it needs to go. It’s a ‘mark’, a scar, a blemish. Looking at it through my Chiropractic eyes…its posture is horrible; it needs an adjustment! The exclamation point. It is standing tall. It appears to say, “Notice me. I’ve got something to say”. It’s a ‘point'; it has direction (anywhere it wants to go). It’s standing tall. It’s got great posture, and it’s proud of it. It looks capable and able. Looking up it sees potential and knows where it needs to go. 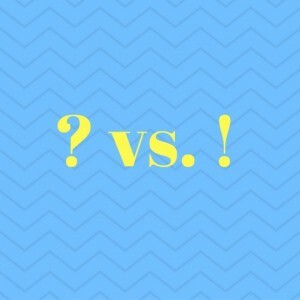 So…are you (posturally speaking) a question mark or an exclamation point? Do you practice standing tall? Or are you mainly looking down at your feet? Do you have a purpose and plan? Are you looking around for possibilities? Get back to living life!